If you have backyard chickens, The Fresh Egg Cookbook might be just what you need to use all those delicious, beautiful fresh eggs. This is one of those cookbooks that is just as fun to read as it is to cook from. Jennifer Trainer Thompson includes tips on keeping backyard chickens, along with stories and observations from her family's experiences with their flock. Plus, this book is packed with egg recipes, both common and unique, and I am inspired to use our eggs for more than just breakfast. Our chickie-babies are such good egg layers. We only get two eggs a day, so we treat them with reverence and respect. That's one reason I'm having so much fun with The Fresh Egg Cookbook. What a great way to use our eggs to their full potential. The presentation of The Fresh Egg Cookbook is so nice. There are lots of color photos, and the colors and fonts feel like a vintage style book. The binding is durable, and the book is a nice size for setting up on the kitchen counter -- just small enough to manage easily, but large enough so that I don't need a magnifying glass to read the recipes! Photos in a cookbook are a must for me, since I'm a visual learner. The pictures in The Fresh Egg Cookbook are really a plus. The recipes are clearly written, and I especially like the introductions to each one that give a little background to the recipe or technique. The ingredient lists are set out in the margins, making it super-easy to make out my grocery list. There is also an index in the back (a definite plus). I am a decent cook, but nowhere near an expert. I always shy away from recipes that are complicated and require too many steps or ingredients to prepare. 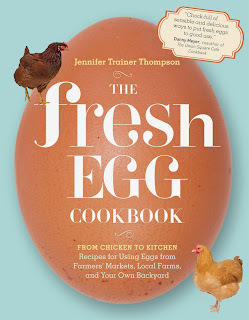 I find The Fresh Egg Cookbook to be easy to use and understand, and the recipes are meals that my family will eat (and they won't eat anything "weird"). Some of the recipes have accompanying photos, but I would like to see photos of all of them.